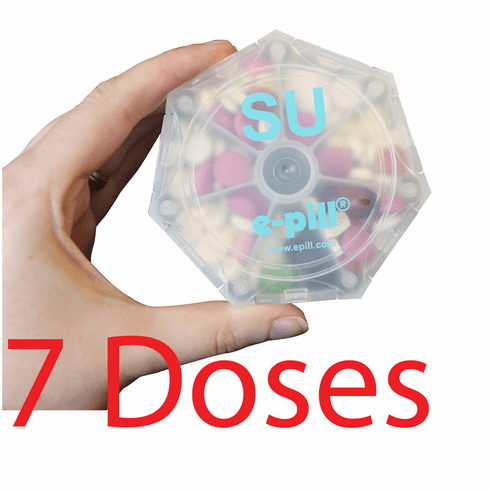 up to Seven (7) Doses per Day Weekly Medication Organizer. 7 / Seven DAILY COMPARTMENTS (7 Doses): Great pill organizer system for elderly, seniors and Parkinson's patients. Divide pills into 7 easy to open single day compartments with easy to open snap-lock lids. UNIQUE DESIGN: 7 X 7 Weekly Pill Organizer System labeled SUN-SAT. 7x doses per day pill box. Stackable pill organizer keeps your prescription medicine organized in place. Seven pillboxes included. COMPACT CASE: Ideal to use daily at Home, Work or Travel. Take your daily pill container with you and carry it in your pocket, backpack, or purse for the day. GREAT PILL ORGANIZER: A great way to get organized without the hassle of opening several different bottles every time you need to take your vitamins and medications. Simply fill once a week and all of your pills will be in one handy location. Organize all your daily medications once a week: Great pill organizer system for home, office or on-the-go. Helps pill identification (pill ID) and can help you improve medication adherence. Popular with Parkinson's patients and any patient with a complex medication regimen. Never Forget to take your Medications Again! Feel Better. Avoid Medication Errors. Seven large capacity pillboxes are included. Pill Capacity: 18 Aspirin sized tablets per compartment. Seven (7) Compartments per Day. Seven pillboxes are included. Color: Clear (Transparent) with Bright Blue Letters indicating the Day of the Week. Size: Stackable pill boxes are 7 sided Heptagon shaped. Each pillbox size is 3 1/2 inch x 3 1/2 inch x 1 inch. Seven pillboxes are included.